I meditated about the fact that Spaniards have paid homage to this universal poet, who once trod their soil of history and legend. I later carried on northwards, toward a tiny town, near Madrid—Medinaceli—, where the Cid once sought refuge during his exile—a town of stones and ruins, Roman and Visigothic, heavy with Iberian mystery, perhaps Celtic, Druidic. The town is on a steep incline, on a hill, and overlooks a dry, arid sea of grizzly, yellow, lunar waves, like a vision from a dead planet. At times, on the distant horizon, there appears a solitary tree, placed there by beauty, by that someone who takes pleasure in ordering the Castilian landscape in order to later contemplate it from the summit of Medinaceli through the old Roman Arch, remnants of an ancient fortification. I learnt of Ezra Pound’s death in Madrid, via the newspapers. The Spaniards paid him heartfelt homage. Eugenio Montes related the burial in Venice, to which I transported myself again with my imagination, toward his little house in Via Querini, seeing him setting off on his last journey, on a dark gondola, through the canals, toward the cemetery in the island of San Michele. The journalist Eugenio Montes told that during the last interview he held with the poet—likely many years ago— the latter had asked him, “Do the Cid’s roosters still crow at dawn in Medinaceli?” And he added that Pound had visited Medinaceli in 1906, following the Cid’s route. Pound loved The Poem of the Cid, which he considered superior to the Song of Roland. He had visited Spain in order to retrace the Way of “The Champion”. In this way he had arrived at that small village high up in the heights, which remains as it was during the Middle Ages. Once again I found myself in a hotel room, now in Madrid. It was evening and I wanted to continue a conversation—cut short one evening in Venice—with my friend’s ghost, now loose forevermore. The ghost came and sat on a chair, I don’t know where, certainly not in that hotel room, and began talking—talking, like he once did so long ago. He was young again and recited cosmic poems; said immortal, beautiful, immense things, like the city of Venice, like the Castilian landscape, like the mountains on the moon. I listened and forgot. Because all such things are forgotten and must never be remembered. The most beautiful square was chosen in that town high up in the heights (‘Medina’ means ‘city’ in Arabic; ‘celi’ means ‘sky’), and there, below an aged tree, the stone was embedded. It would also be a fountain, for water would run over its creased and cracked surface. That stone is like Pound’s face during his final years. The 15 May 1973—St Isidor’s day and the date of the town’s annual festival—was chosen for the monument’s inauguration. I took it upon myself to ensure that Olga Rudge, Ezra Pound’s companion, would be able to attend. Olga was seventy-eight and never went anywhere. But she went to Medinaceli. That day young Spanish poets came from Madrid, along with Jaime Ferrán, Pound’s translator. Also present in Medinaceli were a few American painters who lived there. And also all the townsfolk in their Sunday best, with their well-cared suits; their berets; their shepherd’s crooks; their staffs of pilgrims of the heights; their noble aspects, made out of Castilian rock; their sons; their grandsons, already departing for the cities on the plains, cities without poetry. They were all there to pay homage to that poet from another land, from another world, which they never knew, which they never read—because many cannot read—, but which they know from within, with their rock souls, which resemble the face of the dead poet, of the ecumenical poet. Also there were the dogs and mules that accompanied and brought the stone; also there was the smith, the town’s priest, the Civil Guard, and the wine and the water and the bread, the grass and the birds of Medinaceli, of Old Castile. Also there were the roosters of Pound and of the Cid. Of those vanished warriors. On the afternoon of the homage ceremony, before the entire town, as I have said, and also before Pound’s heroic companion, was lifted the Spanish flag that draped the monument, the ‘face’, the ‘stone under elm’. And then, up on the elm, sung a blackbird. And the town commented on this event and will continue to comment on it for a long time, because the dwellers of those ancient ruined cities, of the towns of yesteryear, are like the Greeks of legend, like the Celts, and the Druids; and discover in a birdsong, on a day of auspices, an event worthy of interpretation, which in this manner fills their lives until their deaths. What else can a great poet wish for, other than to have things recite his poems? What else can he wish for, save for a blackbird to sign his homage? What other proof may be given that a man is great, that a poet is so, except for the sky, for nature, to confirm it by manifesting itself in this way? A blackbird still sings in Medinaceli. And it sings for Ezra Pound. 1. 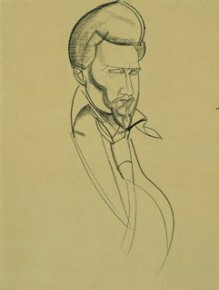 In fact, Ezra Pound died the day before, on 1 November 1972. 2. In Spain, the Cid (real name: Rodrigo Díaz de Vivar) is also referred to as ‘El Cid Campeador’. ‘Campeador’ is the Old Spanish version of the Latin campi doctor, or campi doctus, which translates as ‘master of the military arts’, or ‘champion’. The Way of the Cid (‘El Camino del Cid’), to which Serrano refers, is a cultural tourist itinerary based on the feats of the historical Cid and his literary version in The Poem of the Cid, a XIIth century epic poem and the oldest in Spanish literature. 3. The quote from Pound, which is on a plaque affixed to the stone, actually reads ‘Aun cantan los gallos al amanecer en Medinaceli’, without question marks, which therefore translates as a statement, ‘The roosters still crow at dawn in Medinaceli,’ and makes no reference to the Cid. 4. In Spanish, ‘la Guardia Civil’, the Spanish gendarmerie, a military body charged with police duties among civilian populations. 5. Pound’s Canto XC contains additional verses in between the ones quoted, but here, as further down, Serrano quotes only the verses that interest him in the present context. 6. This is my translation of what Serrano attributes to Nietzsche.